“Mustanging,” was a brutal practice of capture and sale to slaughter. This practice had outraged the American public at large. However the law had a huge backlash from those that had profited from running horses down in the desert, hog tying them to wait for the kill truck and then grinding them up for fertilizer and chicken feed. One such backlash was the “Burn’s Amendment.” Snuck into an omnibus spending bill before Thanksgiving recess, this bill reopened the doors for wild horses and burros to be sold legally to slaughter. READ and take ACTION HERE. One day in 1950, on her way home from work as a secretary in Reno, Velma saw a slaughter truck on the road. Out of the back of the truck blood was dripping. She followed the truck and found wild horses were on their way to “processing.” This began her lifelong crusade to save our majestic wild horses. 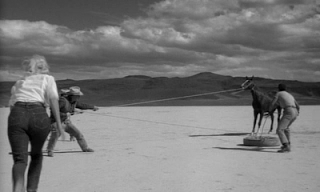 In 1959 the “Wild Horse Annie Act” was implemented to stop the use of motorized vehicles, like the planes and trucks seen in the film “Misfits,” on state land in Nevada. Velma relentlessly documented the horrors of what was happening to our wild horses. With her loyal husband, Charlie Johnston, in full support and often on the range with her, they waged a campaign that spread the truth across the nation. As Charlie and Velma could not have children (Velma was struck with polio as a child) they opened their ranch to children and began a program that included a massive letter writing campaign. That campaign was a vital component to gaining the 1971 Act. Velma stayed active in the crusade and oversaw early removals to ensure safe capture. She continued to report to Congress. As the first government roundups began Velma was diagnosed with high blood pressure and a heart condition. But that is not what finally killed her. 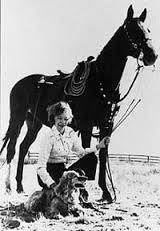 On June 27, 1977 “Wild Horse Annie” died of lung cancer. The program today has more wild horses and burros in captivity than in the wild. Roundup methods are under scrutiny and wild horses are still being removed to favor private interests. There were others that documented the horrors of what was happening to our wild horses including Hope Ryden. Hope also spent extensive time documenting and adding evidence in the case for protection of wild horses. When a case is put in the form of a book as engrossing as this one, it is compelling. Hope Ryden spent a lot of time in the library, and plenty on foot and horseback getting this story. She slept by waterholes, pieced together skeletons, tracked down oldtimers in their eighties and nineties. She explored a huge government tract in Nevada off-limits to humans. The area is replete with flora and fauna, including wild horses, proving that where you subtract man, you add life. Marguerite Henry is well versed in, and indeed well known for, her nonfiction books on horse-related subjects that span the gap between both young readers as well as appealing to a more mature audience, and this piece is no different. Henry turns her literary eye towards the mustangs, horses of the American west that descended from the escaped mounts of the Spanish conquistadors. We are shown the plight of the iconic horses through the eyes of a young Velma Bronn, who would come in time to be known as “Wild Horse Annie”, a woman born and raised in Nevada in a pioneering family in the early 1900s. As a girl, Velma is given a mustang pony by the name of Hobo, a character that would become a pivotal and indeed vital part of the story of Wild Horse Annie. Early in her married life some years later, she learns of the true plight of the wild mustangs; of the ranchers distraught with the grass being eaten by the wild horses on their land, and of the dealings between the ranchers and the U.S Bureau of Land Management, or B.L.M, to conduct aerial round-ups of entire herds. Wild Horse Annie began a war that we still wage today; a battle that started with a handful of county commissioners and led to the footsteps of Congress itself. Her story is one of adversity and true conviction, and of staying true to the creatures that helped forge a nation. This tale remains as true today as it did almost fifty years ago, and on the anniversary of Velma Bronn’s passing I would invite all of you reading this to take a moment to reflect on her story, and her life, and to share this story with your friends and children. This post is done on June 27, 2014 to honor the memory of those that began this fight to protect our mustangs and burros. Today our challenges are different as we fight for accountability to the intentions of protection began by those before us. We thank you all for your dedication and will carry our part in this fight until we hand it to the next generation ~ WildHorseEducation.org Stand with us.